1. In order to track items raised at previous meetings that require actions or follow-ups, a list of outstanding items is prepared for each meeting. All action items indicate who is responsible for each action, when it is expected to be completed and a brief status comment. Once the items have been completed and reported to Council they will be removed from the list. 1. That the Committee receives the report “Action Items from Previous Corporate and Strategic Committee Meetings”. 1. Council traditionally adopts a Schedule of Meetings for the next 12 months in November each year. 2. The proposed 2013 schedule of meetings has been developed taking the following into consideration. 2.4. Regional Transport Committee meetings scheduled four times per year. 2.5. Timeframes for Annual Plan development, consultation and audit. 3. The proposed 2013 Schedule is attached for the Committee’s consideration. 4. Council is required to make every decision in accordance with provisions of Part 6, sub-part 1 of the Local Government Act 2002 (the Act). Staff have assessed requirements contained in the sections of the Act in relation to this item and have concluded that the decision making provisions of the Act do not apply as adoption of a schedule of meetings is specifically provided for under Schedule 7, Part 1, Section 21 of the Local Government Act 2002. 1. The Corporate and Strategic Committee recommends that Council adopts the 2013 Schedule of Meetings as proposed. 1. This agenda item updates Council on the top ten risks facing it and seeks agreement to the risk mitigation approach proposed for each of those risks. 2. The risk management approach to the top 10 risks was approved by the Strategic Planning and Finance Committee in September 2009. This approach includes the need to report to Council 6 monthly on the top 10 risks with the potential to impact Council. The last report was considered by Council on 16 May 2012, through the Corporate and Strategic Committee. 3. A new risk, “New Technologies” has been included, in place of Hazardous Activities and Industries List (HAIL). Staff have now worked through the majority of the issues associated with HAIL and believe there is no longer justification for including it within the top 10 risks. New technologies recognises the risks to HBRC of technologies that have the potential to impact on HBRC Regional Plans, processes associated with those Plans, and LTP budgets where they have not been foreseen in the preparation of those Plans or budgets. 4. Attached are the following documents. 4.1. An assessment of the top 10 risks facing Council in accordance with Council’s risk policy framework. 4.2. A summary risk register outlining the current and future position of each risk issue; the current situation and risk associated with each of these; the proposed risk mitigation approach and the change since May 2012. 5. The proposed risk mitigation approaches will be undertaken as part of planned work programmes for Council staff. Additional resource or financial input in addition to the provisions in the 2012/22 Long Term Plan is not believed to be required at this stage. 6. It should be noted that the risk mitigation programme associated with a number of these risks is now in place and accordingly the current level of risk is being effectively managed. 7. Staff will continue to monitor current and emerging risks and regularly report to Council in accordance with the risk management policy framework. 8.1. The decision does not significantly alter the service provision or affect a strategic asset. 8.2. The use of the special consultative procedure is not prescribed by legislation. 8.3. The decision does not fall within the definition of Council’s policy on significance. 8.4. No persons are directly affected by this decision. 8.5. Options that have been considered are set out in this paper. 8.6. The decision is not inconsistent with an existing policy or plan. 8.7. Given the nature and significance of the issue to be considered and decided, and also the persons likely to be affected by, or have an interest in the decisions made, Council can exercise its discretion and make a decision without consulting directly with the community or others having an interest in the decision. 2. Notes the top ten risks currently facing Council. 3. Approves the risk mitigation approach to each of the ten risk issues as set out in the attached narrative. Water quality in the rivers of Hawke’s Bay is declining and HBRC are not quickly and effectively addressing this issue. The potential for water quality in the region’s water bodies to decline is real without ongoing proactive management by HBRC. HBRC has a major focus on this issue with long term mitigation programmes provided for in the LTP 2012/22. The public of Hawke’s Bay are increasingly concerned at the quality of water in the region’s rivers, and that there could be a decline in the quality of water in our key aquifers. HBRC monitors water quality at a network of sites throughout the region and reports annually on trends through its State of the Environment report. Water quality continues to be a focus of HBRC. Provision for the following projects has been included in the 2012/22 LTP. These projects will in the long term result in improvements to water quality in water bodies in HB. The National Policy Statement for Freshwater Management came into effect on 1 July 2011. This requires regional councils to set water quality limits and timeframe targets in regional plans. A Plan change for the Tukituki River is progressing. HBRC Regional Plans include a policy and regulatory framework for the management of water quality in the region’s water bodies. Through the Regional Landcare Scheme, HBRC encourages land owners to fence stock out of waterways and improve farming practice. · HBRC has focused on the completion of the Ruataniwha Water Storage project as a key element of this risk mitigation strategy. · HBRC has adopted its 2012/22 LTP which provides for the resources for a programme of work to mitigate this risk. · A proactive approach continues to be taken on Taharua catchment to reduce farming impact on water quality. · Construction work for Mahia Beach waste water project has commenced. This project will irrigate waste water from the Mahia Beach Community to the HBRC forest planted last winter. · Council has deferred the commencement of the Regional Afforestation project due to the reduction in the carbon price, limiting HBRC’s potential exposure to this. · Two Water Symposiums held and well attended. · HBRC Strategic Plan and Hawke’s Bay Land and Water Management Strategy completed and being implemented. · Ruataniwha and Ngaruroro water storage feasibility projects progressed. · Science input appropriately targeted to sensitive catchments and risk areas including a review of minimum river flows and allocation limits for ground water and surface water on a targeted catchment basis. · Council led initiative to investigate water harvesting opportunities, water metering and water use efficiency through rationing and rostering. · Water Initiatives Group established within Council to focus on water issues. · Programme of Regional Plan changes initiated to meet HBRC obligation associated with NES initiated. · More holistic approach to Council involvement with primary sector being taken by Council with objective of reducing impact of sector on water quality. · Riparian fencing and planting continues to be encouraged through Council’s Regional Landcare Scheme and Fonterra’s Clean Streams Accord. HBRC is failing to appropriately manage the allocation of water with a fair balance between protection of environmental flows and adequate provision for irrigation leading to economic growth. As for water quality, HBRC has recognised the need for ongoing proactive management of water quantity issues. HBRC has a major focus on this issue with long term mitigation programmes provided for in the LTP 2012/22. The appropriate allocation of water is a balance between the needs of the public and the regional economy, including domestic users and irrigators, with environmental requirements. This requires a robust understanding of environmental and agricultural needs. 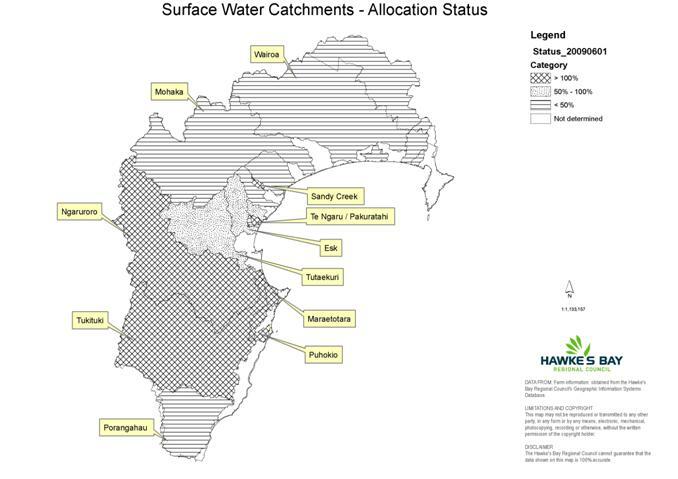 The map below shows that the Tukituki, Ngaruroro including the Karamu, Maraetotara and Pouhokio catchments are currently either fully or over allocated. The Ruataniwha water storage project has the potential to enable this issue to be addressed in the Tukituki catchment. In the longer term, HBRC needs to have an effective framework for the management of water allocation for all of the region’s catchments. This is recognised as a National risk. National Policy Statement for Freshwater Management came into effect on 1 July 2011 to provide direction on the management of the issue. This requires regional councils to set water quality limits/ timeframe targets and water allocation limits and minimum flows in regional plans. It also provides for the involvement of tangata whenua in freshwater planning and management. · HBRC’s Strategic Plan, the Hawke’s Bay Land and Water Management Strategy and the 2012/22 Long Term Plan provides the framework and resources for a programme of work to mitigation of this risk. · HBRC has adopted its 2012/22 LTP which provides for the resources necessary to mitigate this risk. · Collaborative engagement has commenced for the greater Heretaunga/Ahuriri Catchments. · Programme of Regional Plan changes initiated to meet HBRC obligation associated with NPS initiated. HBRC is not effectively managing the impacts of intensive land use and this is adversely impacting on water quality in the region’s rivers. The impact of land use intensification on water quality and quantity are recognised and ongoing proactive management of land use activities is provided for in the LTP 2012/22. Intensive land use, and particularly dairying, is widely blamed for adversely impacting on water quality in rivers throughout New Zealand. There is evidence of this in Hawke’s Bay through HBRC state of the environment monitoring and reporting. Regional councils have been blamed for failing to effectively manage these impacts. HBRC is actively working with individual farmers and their industry groups to improve the management of nutrients on the land and reducing their impact on water quality in the region’s rivers. · Improve the focus of RLS to provide for initiatives to reduce P and N entering waterways – key initial target areas are Taharua catchment and Ruataniwha Plains. · Taharua and Tukituki Catchment Plan changes have been progressed, with the long term plan to undertake further catchment based plan changes. · The pan-sector primary industry sector group has been established to provide an effective focus group with which to discuss options and approaches for mitigation, and to gain industry support in promoting those approaches. · Two meetings held with pan-sector primary sector group. · One meeting held with dairy liaison group. · Work with Taharua and Huatokitoki communities progressing with nutrient balance model being developed for Taharua. Proactive approach continues to be taken on Taharua catchment with positive response from the farming community. · The mitigation of the impacts of land use intensification has been thoroughly researched as part of the Ruataniwha water storage feasibility study. A pilot project to test a mitigation approach has been agreed by Council in October 2012, and its implementation has commenced. · The Land Management team and its programmes have been refocussed to increase capability of influencing uptake on good practice farming and reducing impact of land use on water quality. · Strong relationship built with primary sector industry groups and groups of farmers to encourage the use of best practice. · Identification and prioritisation of sensitive catchments completed and a programme of work established to address catchments in order of priority. · Regulation is being developed using an adaptive management approach, with standards agreed with community. · The Ruataniwha water storage project has been progressed. · The Regional Landcare scheme is supporting the HBRC approach with significant investment made in Taharua. · Better alignment of science programme to informing Regional Plan change programme and land management programme to implement Plans. Effective working relationships are not developed and maintained with Hawke’s Bay Treaty of Waitangi settlement groups. HBRC continues to develop robust relationships with Māori groups and is working collaboratively towards their increased influence in HBRC decision making. Constructive and effective working relationships with Treaty Settlement groups in particular and with Maori in general will enable HBRC to more confidently progress its programmes of work and will in the long term provide opportunities for Hawke’s Bay. · The Regional Planning Committee has been formally established and is meeting regularly. · HBRC is proactively involved in negotiations with Treaty claimant groups where this assists in progressing their claims. · Staff are engaging with a number of hapu groups to improve their understanding of HBRC’s role and work, and to increase their involvement in decision making on environmental enhancement projects and operational activities on the region’s water ways (at this stage focussed on the Heretaunga Plains). · Development of Deed of Commitment to underpin the long term relationship between Council and Treaty Claimant groups. · Inaugural meeting of the Regional Planning Committee in April 2012. · RMA and Meeting procedures training sessions held for Treaty claimant representatives on the Committee. · Regional Planning Committee meetings being held regularly and currently focussing upon a change to the Regional Plan Change and Regional Policy Statement in the area of freshwater management. · Negotiations with Maungaharuru Tangitu Inc. over Tangoio Soil Conservation Reserve and Tutira progressed. · Regional Planning Committee established to undertake HBRC’s statutory resource management functions, with equal representation of Councillors & Treaty Claimant representatives. · HBRC has received central government funding to work on an agreed programme with Ngati Pahauwera around the management of the rivers in their rohe. · National Policy Statement for Freshwater Management came into effect on 1 July 2011. This requires regional councils to set water quality limits/ timeframe targets and water allocation limits and minimum flows in regional plans. It provides for the involvement of tangata whenua in freshwater planning and management and this will be undertaken primarily, but not solely, through the Regional Planning Committee. HBRC’s investment portfolio is not effectively managed to maximise both long term financial returns and economic development in the Hawke’s Bay Region. With the establishment of HBRIC, this risk has an effective governance and management framework for its mitigation. HBRC holds a portfolio of approx. $265m of investment assets. These include Hawke’s Bay Regional Investment Company (HBRIC) [which holds the shares in Port of Napier Limited (PONL)], leasehold land in Napier and Wellington and cash reserves. HBRC strategy is to invest in regional scale infrastructure and assets to deliver sustainable regional growth. HBRC is reliant on income from investments to meet operational costs. There will be a period of several years while HBRC transfers from traditional investments to new investments aligned to its investment strategy of increased investment returns in those areas that will be of direct benefit to growing the Hawke’s Bay GDP. During this period there needs to be careful management of investment returns and cashflows. The 2012/22 Long Term Plan makes provision for investment into the Ruataniwha water storage project and a regional afforestation initiative. It is essential that investment into these initiatives is effectively managed. Through the LTP consultation process, HBRC sought public feedback on its proposed financial strategy. HBRC has resolved to better utilise the investment portfolio to encourage economic growth in Hawke’s Bay and use the return on these investments as the primary funding instruments for new investments. During 2011/12 HBRC set up an investment company structure including related subsidiaries. This vehicle is being used to improve the diversification of investments and the return on HBRC investments. · Ruataniwha Water Storage Project Feasibility Study progressing – completed and presented to Council on 26 September 2012. Further report to Council by 31 October 2012. · Council has progressed realising value from the Napier leasehold land portfolio by providing discounts to the lessees of this property. · Financial strategy adopted as part of LTP 2012/22 process. · An Investment Company has been established to support Council’s proposed investments in natural infrastructure which will assist with the drive to increase economic development in the region. · Sell down of Napier investment properties speeded up. · Ruataniwha water storage prefeasibility and feasibility now completed. · Ngaruroro water storage prefeasibility completed. · Regional afforestation project approved in principle as part of LTP 2012/22 process. · The policy on the evaluation of investment opportunities completed and is being implemented. Financial risks associated with this project are mitigated through its governance under HBRIC. A decision to proceed with applying to the EPA for resource consent on the Ruataniwha Water Storage Project was made by Councillor’s on 31 October 2012. Whatever the decision there are risks to HBRC. The rate of uptake of irrigation water, the management of the transfer of existing water take consent holders and management of project infrastructure costs are key risks. Should the EPA not grant resource consent the ongoing issue of water allocation within the catchment and water quality within the Tukituki River remain issues to be addressed. The feasibility study has provided significant value through a greater understanding of the importance of water to Hawke’s Bay and strategies to manage potential impact of intensive land use on water quality in the region’s rivers. · It is proposed that the consent, final design and construction phase be managed and funded through independent governance and organisation, through which HBRC will be involved together with a number of other investors. · Communication plan to manage dissemination of decisions made regarding future of project, and ensure public feedback is taken into account. · All potential impacts of the project, (including damming of the Makaroro River and intensification of land use as a result of irrigation) identified and addressed through robustness of the feasibility study work and reports. · Involvement of HBRIC independent board members in assessing feasibility and risk management issues. · Financial advice to assess commercial feasibility in detail has formed part of feasibility study. · Public comment has been obtained through the Tukituki Choices document. · Feasibility study report completed and presented to Council 26 September 2012. · Tukituki Choices document prepared and public consultation completed. · Feasibility study initiated and completed. · Upper Tukituki Plan change process initiated and being developed concurrently with Storage Project feasibility. HBRC leasehold land portfolio is not aligned to the strategic objective for HBRC investments. · HBRC receives relatively low returns on Napier Leasehold Land investment. There is some restriction on the use of Napier leasehold income through Hawke’s Bay Endowment Land Act. · Some lessees find it difficult to meet the cost of leases, particularly at the transition from old to new lease periods. This requires HBRC to consider reducing social impacts of leases. · The leasehold land as an investment does not contribute to economic development of the region. · HBRC has agreed to divest itself of lease properties both in Wellington and Napier. In order to achieve this HBRC approved a range of discounts available to Lessees of Napier Leasehold property, this action being taken to encourage additional free holding by lessees. These discounts applied to all leasehold transactions being processed prior to 30 June 2012. · Decision by Council as part of the Long Term Plan 2012/22 finalisation that the Napier Leasehold land cash flows remaining at 30 June 2012 should be sold by the target date of 31st December 2012. · The target date for the sell down of Wellington Leasehold properties has been set in the Long Term Plan as 30 June 2013. · 245 properties sold during period of discounting up to 30 September 2012 ($23m realised). · A further 37 properties ($3.8m) to be accepted and processed under the discounting offer. · After all processed under discounting offer, 440 properties left in the portfolio. · 2012/22 Long Term Plan adopted by Council. · Sell down of Napier leasehold properties speeded up. The lack of resilience in pastoral farms on steep erodible hill country has a potential negative long term impact the Hawke’s Bay economy. The significant reduction in the carbon price over the past 18 months has adversely impacted on the forecast returns from this investment. A decision to delay the commencement of the Regional Afforestation project limits HBRC’s potential exposure to this. Approximately 150,000ha of steep erodible land is currently under pasture. This land is likely to be of low productivity and poses a risk to more productive lands and waterways during heavy rain events because of the likelihood of erosion. The economic health of the primary productive sector is important for the economic health of Hawke’s Bay. HBRC wish to increase their influence in encouraging sustainable land management in Hawke’s Bay. Forestry, if integrated into pastoral farming systems, can reduce erosion of the steepest land and provide opportunities for farmers to focus on their more productive land, thereby improving resilience and sustainability. HBRC approved in principal as part of their LTP 2012/22 a long term project for the afforestation of steep erodible hill country integrated into farming systems. However due to low carbon price the commencement of this project has been delayed. No planting in the 2013 winter is now anticipated. While the project is targeted at improving the resilience of the primary productive sector in Hawke’s Bay, this is being funded through HBRC investment portfolio. HBRC requires a return on investment for the money invested in the project. The management of financial risks forms part of the overall strategy. · Concept completed and approved in principal by Council. · Year one of the project including a carbon trading strategy, considered by Council and postponed due to low carbon price and carbon market uncertainty. · Discussions held to date with farming community have received positive response. · A number of individual farmers have expressed their interest in the concept. · Project concept developed and included in LTP 2012/22. Submissions on proposal generally supportive of initiative. · Land purchased and forests planted on a number of blocks throughout the region. · Manuka trial initiated at Tutira Country Park. HBRC is limited in its ability to influence an improvement in resilience of the Hawke’s Bay community to natural hazards. Land use planning decisions are made by the region’s territorial local authorities. HBRC staff continue to work at a national level to seek ways to encourage better interpretation of hazard information and risk mitigation approaches through holistic planning. HBRC is the administering authority for Hawke’s Bay CDEM Group, HBRC are proactive in seeking to improve resourcing of CDEM in HB. The Hawke’s Bay region is at risk from flooding, earthquake, tsunami, coastal erosion and inundation and volcanic ash fall. The Heretaunga and Ruataniwha Plains are protected from flooding from the major rivers running through them by stopbanks with a 1% annual exceedance probability (100year return period) design standard. HBRC has an ongoing programme of hazard identification research with new information communicated to the region’s territorial local authorities and emergency response organisations. Major events, severe flooding and earthquake have impacted on the region in the past and will again in the future. · HBRC maintains an incident response structure and procedures which activates with the threat from any significant natural hazard event. · HB Group CDEM team resource has been increased and now includes a dedicated group controller. · The HB CDEM Group Plan is currently being reviewed with the work overseen by the Coordinating Executive Group and CDEM Joint Committee. · Joint Natural Hazard Strategy completed. · Insurance to cover the cost of repair of infrastructure assets is in place. · Change the Regional Policy Statement proposed in the Long Term Plan 2012-22 to improve policy direction on managing the effects of natural hazards on land use. · The CDEM Group Plan is currently under review. · A review of HBRC arrangements for insurance of its infrastructure assets is underway. · Ongoing natural hazards and coastal hazard research and is recognised nationally as proactive in these areas. · HBRC staff are involved in a number of national and local initiatives associated with natural hazards readiness, reduction and response planning. · Staff facilitates regular meetings with the HB planning group (including TLA and RC planners) to ensure common and thorough understanding of hazards and a common approach for risk reduction through planning mechanisms. · Council has a business Continuance Plan setting out how Council will continue to do its business if staff are unable to access the office. The plan is regularly updated. Local government reform results in significantly reduced commitment to Regional Council functions. The value to the region of an organisation such as HBRC focussing on long term sustainable management of the region’s resources is not well understood by the public. The risk of the loss of this focus through local government amalgamation is real. Local government reform is currently being considered by central government through a discussion document “Better Local Government”. This focus may not be as strong under a structure possible as a result of possible reforms in HB. · Submission made on “Better Local Government” discussion document. · Submission made to the Local Government and Environment Select Committee on the proposed local government law reforms (Phase 1). · A prosperity study has been initiated and is programmed for completion end November 2012. · Chair and Chief Executive continue to be active in working with Central Government agencies and politicians to communicate the regional council value proposition in national resource management and economic development, including environmental, cultural, economic and social aspects. · Regional Planning Committee with equal representation of Treaty Claimant Groups reinforcing the resource management role of HBRC has been established and has a regular forward meeting timetable. · The option of joining a shared services company with the region’s territorial authorities was consulted upon through the Draft 2012/22 Long-Term Plan. Recommendations from this were presented to Council in September 2012. · HBRC continues to develop very good profile – Government Ministers, Local central government politicians, Government Department CEs, (MPI, MfE, and DoC etc.) The relevance of regional councils continues to be demonstrated and promoted. There is now a much greater awareness of the value of regional councils by central government. · Stage 1 of Prosperity Study notes that any consideration of local government reform must avoid undermining or compromising the delivery of the Ruataniwha water storage scheme. · Substantial improvement across regional council sector in collaboration and coordination. · Establishment of “Nature Central” with central government and other regional councils focussing on the sharing of services and expertise in the areas of natural resource management, community engagement, open spaces and biosecurity. · Background work leading to the above achievements since May 2012. The impacts of new technologies with the potential to be used in Hawke’s Bay are unable to be effectively managed as they were not foreseen in the development of Regional Plans and/or policies. New technologies will continue to be developed that challenge established resource management approaches. · A report is being prepared by the Parliamentary Commissioner for the Environment on hydraulic fracturing. o Working closely with other regional councils. o Investigating approaches taken to regulate the activity internationally. · Potential environmental and economic risks from genetically modified organisms are addressed under Environmental Risk Management Agency legislation. The potential advantage to the Hawke’s Bay economy of remaining GE free was raised in submissions on HBRC draft LTP 2012/22. · Maintain an awareness and watching brief on new technologies that could be used in Hawke’s Bay, including out to the 12 nautical mile area offshore which is within the HBRC area of jurisdiction. · Reference to both of these risks has been included in HBRC LTP 2012/22. o The outcome of a report being prepared by the Parliamentary Commissioner for the Environment on hydraulic fracturing is awaited before HBRC considers what action if any should be taken. o HBRC will join with interested parties in participating in a forum to determine a collective regional response to GMO. Financial, health and safety, contractual, and other operational risks are not effectively managed and controlled. Operational risks are managed through established protocols, procedures and processes. These must be reviewed, and where appropriate improved, to ensure operational risks continue to be effectively mitigated. · Established corporate structure with clear responsibilities, established levels of expertise and experience, and performance expectations, including for emergency response situations. · Financial – levels of financial delegation, regular and transparent financial management reporting, and annual audits. · Health and Safety – Codes of practice for activities commonly undertaken by staff, the provision and use of appropriate personal safety gear, an active Health and safety committee. · Adequate budget provision to enable an appropriate expertise, review and peer review for projects and activities. · 2011/12 Annual report completed and audited and reported to Council. · Tertiary level of Work Safe Management Programme with ACC maintained following audit. · Tertiary level of WSMP maintained throughout last 3 years. 1. The purpose of this paper is to provide Council with Hawke’s Bay Tourism Limited (HBTL) results for the three months to 30 September 2012. 2. At its meeting on 25 May 2011 Council resolved to approve the funding agreement between the Hawke’s Bay Regional Council and HBTL. Section 11 of this funding agreement provided for a quarterly and annual report to be presented to Council to enable Council to monitor the outputs/outcomes being achieved and the financial progress against budget given the commitment by Council to fund HBTL, through a payment of $850,000 each year for three years commencing 2011/12. 3. A report from HBTL setting out achievements, progress towards the key performance indicators as set out in the funding agreement, together with the Company’s financials, are attached to this paper. 1. That the Corporate and Strategic Committee receives the report. Hawke’s Bay Tourism Limited is now into its second year of operation. Membership numbers are sitting at 193 tourism and related businesses. After meeting all first year KPI’s we are in the early stages of completing our second year KPI’s. Major initiatives completed this quarter include the introduction of F.A.W.C! – Food and Wine Classic Hawke’s Bay as a new food and wine event platform for the region, attendance at Hot Red and the Foodshow in Auckland, industry sector updates, conference group famils and continued PR, and media planning. Please see the detail within the KPI report. Overall results for Hawke’s Bay year end August combining Commercial Accommodation and Private Household figures show a flat result with only 2,195 additional guest nights or 0.1% growth. July – August is not traditionally a busy travel period and the economic climate combined with the hangover from RWC (particularly in August and September) has compounded to reveal poor arrival results in the commercial accommodation sector. Overall the Commercial Accommodation Monitor for August 2012 shows Hawke’s Bay guest nights down 27.8% compared to the same period in August 2011. This equates to 15,845 less visitor nights in the region in August. Hawke’s Bays closest neighbors have also seen the same result with the Bay of Plenty down 31,000 guest nights (-37.9%) and Taupo down 12,000 guest nights (-18.6%). The Private Household Monitor estimated 35,359 visitors to the Hawke's Bay Region stayed 146,523 nights in private accommodation during August 2012. This was an increase 4,300 guest nights on the previous August. Note this excludes those who stayed in holiday homes and baches, but includes children aged 15 or under. The major reasons for visiting Hawke's Bay were visiting friends and family (48.2% of total nights stayed), international students (16.5%) and general holiday or leisure (15.1%) of total nights stayed. Visitors to the region stayed an average of 4.1 nights in private accommodation. International visitor arrivals into New Zealand are again being propped up by massive arrivals from China (+24.9% for August and +33.8% year end August). An additional 45,706 Chinese visited NZ this year compared to the previous year. Australia remains the number one visitor market for New Zealand with 1.178m arrivals recorded year end August 2012. The organisation has been working towards the goals and objectives set out in the Strategic Plan signed off by HBRC in May 2011. 1. Hawke’s Bay Tourism - Establishment of a new Regional Tourism Organisation achieved July 1, 2011. The organisation continues to gain traction with sector groups within Hawke’s Bay and is well established within the national tourism framework as the official Regional Tourism Organisation. 2. Brand - Establishment of a “Hawke’s Bay” brand and communication tagline. The brand “Hawke’s Bay” and tagline “Get me to Hawke’s Bay” continue to be used in all communication. Extensions to the campaign include a focus on the family and boomer age markets. 3. Consumer Marketing - HBT has taken a far stronger domestic focus in the first quarter with solid plans around attracting visitors for F.A.W.C! Food and Wine Classic in November, and the family market for visits over the summer holidays and into February. Grab a Seat Campaigns with Air New Zealand have resulted in good bookings for the latter part of the year as well and a campaign with Jason’s Travel to over 100,000 domestic travellers has seen positive results. Hawke’s Bay has featured heavily online in this first quarter both with online banners and dedicated search engine marketing. For the 12 months to year end September hawkesbaynz.com has delivered the following. The revised website is performing exceptionally well and unique visits have increased over 200% in the first quarter. While time spent on the site is lower, this is a reflection of people finding what they want more efficiently. Search activity in the first quarter is generating solid traffic to the website per month. Search is fundamental and provides a strong base of traffic to the Hawke’s Bay website. Research – the quarterly visitor performance monitor has been established to accurately report on all aspects of tourism for Hawke’s Bay, this is communicated to industry quarterly. Hawke’s Bay Tourism has hosted four famils in the first quarter. They include inbound operator famils focused on the cruise market, an industry famil to Haumoana and Te Awanga of 43 local operators, a Carnival Cruise Famil and a group from wholesaler ANZCRO UK. 62 ships scheduled to visit Hawke’s Bay this cruise season with the first Sun Princess having arrived 30 October. It is estimated 96,010 passengers will visit Hawke’s Bay which is an increase of 2.9% on the previous year. 61,319 are due from Australia, 13,494 from the USA, and 8,861 from the UK. Crew visits are expected to total 43,244 which is an increase of 16.6% on the previous year. Annual tourism update/report was presented to over 120 operators in July. This was a look back at the previous year as well as a look ahead to future plans for the organization. Hawke’s Bay staged the first Tourism Awards for the region in September. Twenty six local businesses entered the awards. The top three finalists were Birdwood’s Gallery & Sweet Shop, Hawthorne House and The Dome Apartments. The overall winner, announced at the Chamber Business Awards was Birdwoods Gallery. The judging panel consisted of Peter Blackwell (General Manager of AA Tourism), Dave Simmons (General Manager, Online & Leisure at Air NZ), Jenny Robertson (Head of the Tourism & Hospitality School at EIT) and Stuart Webster (partner at Sainsbury Logan & Williams and director of Hawke’s Bay Airport). Over 200 tourism operators attended the awards night in September. Industry forum held in Central Hawke’s Bay with a group of 8 local tourism operators. Individual workshops with tourism industry partners continue. The Regional Events Strategy is well underway and in the first quarter of this financial year we have launched the promotion of F.A.W.C! Food and Wine Classic Hawke’s Bay. This was a major objective of the Regional Events Strategy - to establish a food and wine related flagship event for the region. The Event Advisory Group is also well established and meets on a regular basis. HBT also assisted in the promotion of “Napier – for the Ride of your Life” in July. Hawke’s Bay Tourism Ltd is tracking favourably in the first quarter of the financial year. 1.4. Be more inclusive, cohesive, and responsive to communities/iwi/business. 2. Chief Executives of the Greater Wellington, Hawke’s Bay and Horizons regional councils, as well as the Department of Conservation’s Director-General, met recently and agreed to formal collaboration in the management of natural resources and recreation across the lower North Island. Through greater collaboration between the organisations far more can be achieved than any of the individual organisations can achieve alone. 3. The vision for the initiative is for a significant shift in the way organisations approach the management of natural resources across the lower North Island. This includes the following. 3.1. A more explicit recognition that the economic, cultural and social wellbeing of all our communities is reliant on ‘services’ provided by the natural environment and the effective management of them. Sustaining our current levels of economic activity will require the sustaining of ecosystem services. 3.2. Recognition that the organisations need to better understand a wider range of values and work on a scale and in a way that makes more sense to communities. There will be a shift away from establishing management priorities based on administrative boundaries, toward establishing management priorities that are based on more logical ecological or social boundaries. It is recognised that landscape or catchment scale management will generally be more appropriate for understanding and managing ecosystem processes together with social, economic and political considerations. 3.3. More emphasis on prioritising and working together, as well as with iwi, communities and business both to identify the full range of values associated with areas and to look after them. Greater investment in these inclusive processes has huge potential to deliver wide benefits for protection of services that humans rely on for their wellbeing, and for the conservation of our natural heritage. 3.4.5. more effective use of limited resources and less duplication of services and processes. 4. The project will initially focus on combining efforts in the areas of recreation, biodiversity, regional park management, biosecurity and the sharing of technical advice and expertise. 5.4. wide scale predator protection on Maungaharuru Range including Boundary Stream and Lake Opouahi in Hawke’s Bay and other similar biodiversity enhancement initiatives within the Wellington and Horizons regions. 6. This is a shift away from the traditional management which was based on the roles and responsibilities of the respective organizations as well as geographic and administrative boundaries, however it is only the first step in the process and the Nature Central partners will be exploring more initiatives in the near future. 7.6. DoC and HBRC open space facilities management and maintenance being delivered collaboratively. 8. It is proposed to secure a person (possibly seconded from Department of Conservation) to provide the necessary resource to work with each of the organisations, identify and develop opportunities, and to assist in the implementation of the high priority initiatives. HBRC has agreed to contribute to the cost of this secondment. As many of the opportunities are expected to fall within the biosecurity and open space areas of HBRC business, funding of HBRC’s contribution (expected to be approximately $40,000 spread over 2 financial years) will be sourced from those budgets. No new funding is expected to be required. 9. Council is required to make a decision in accordance with Part 6 Sub-Part 1, of the Local Government Act 2002 (the Act). Staff have assessed the requirements contained within this section of the Act in relation to this item and have concluded that, as this report is for information only and no decision is to be made, the decision making provisions of the Local Government Act 2002 do not apply. 7(2)(b)(ii) That the public conduct of this agenda item would be likely to result in the disclosure of information where the withholding of that information is necessary to protect information which otherwise would be likely unreasonably to prejudice the commercial position of the person who supplied or who is the subject of the information. 7(2)(i) That the public conduct of this agenda item would be likely to result in the disclosure of information where the withholding of the information is necessary to enable the local authority holding the information to carry out, without prejudice or disadvantage, negotiations (including commercial and industrial negotiations).